This is an English "mirror" of a news service from the Danish association CSA (Center for Studies in Workinglife) - the Danish languaged news site: www.nyt-om-arbejdsliv.dk. Here you have information about comming conferences within working life, new and forthcomming books. 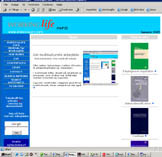 Besides you can be informed about articles in the Danish learned journal Tidsskrift for Arbejdsliv (Journal for Working Life). Foreigners can now find the most of the 506 Danish researchers in our database.